A gas Oven has natural gas or propane piping connected to it, and burns the gas in a burner which gets hot and then raises the temperature high enough inside of the oven so that it begins to cook the food that is placed inside of it. If your oven does NOT have natural gas or propane piping connected to it, then you have an 'electric Oven,' and you should put a checkmark for 'Oven (electric)' as a home feature, instead of 'Oven (gas)' in your Home Wizard app. Ovens come in different types such as: "Self-Cleaning"; Continuous Cleaning"; and Conventional". Self-cleaning ovens clean themselves by oxidizing (burning off) food splatters at a very high temperature during the cleaning cycle. For continuous cleaning ovens, the oven walls are coated with a catalyst, or chemical mixture, that oxidizes food splatters when the oven is operating. A "double oven" is a wall unit which contains two separate oven units. 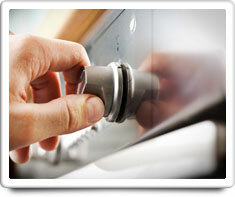 A gas Oven is also different than a Microwave Oven. A Microwave Oven is an electric kitchen appliance that sits on a counter or it can be built into a cabinet. A Microwave Oven uses microwave radiation to stimulate the food and liquids that are put inside of the unit, to generate the heat which raises the temperature to cook the food or to warm up the liquids. And a Microwave Oven is typically only large enough to hold one plate of food, where an gas Oven is much larger, and can hold several pots and pans at the same time. Microwave Oven, Oven (electric) and Oven (gas). Shown in the 'Routine Care' section are the recommended routine maintenance tasks for your oven (gas). The 'Q & A' section shows answers to common questions. And the 'Articles' section provides helpful articles about your oven (gas).